Control your mobile music with eyeball-activated earphones! Fabulously daft- yet somehow compellingly clever – are these bizarre eye-controlled earphones which have been shown off at the Mobile World Congress in Barcelona. 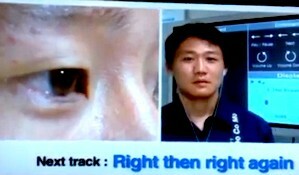 We cant say we’ve ever felt aggrieved by the lack of eye controlled earphones out in the market, but Japanese communication giant NTT Docomo reckon they could be reaching into an untapped market of potential eye twitchers. Their research team have created a pair of earphones that control music playback through specific eye movements, based on a medical technique called electrooculography. Here’s how it works: the earphones register the electrical impulses released by your eyes when they move in certain directions, and these are converted to playback commands. For example, to press ‘play’ you move your eyes from right to left and to increase the volume you move your eyes clockwise, and so on. We suspect folks rapidly flicking through a large collection of songs on the tube may attract some unwanted attention, but at least it solves the age old problem of how to answer the phone when you’re carrying two heavy bags of shopping.